Marlin Steel design engineers will coordinate the manufacture of your Metal Brackets and other Metal Fabricationparts for industrial and commercial applications - submit your drawings (in PDF format, by fax, or even as an actual sample) and we will respond with a fast quote. We generate precision AutoCAD prints detailing the front view of the sheet metal component, side view, top view, and an isometric view (as if you were standing over the unit near the corner). 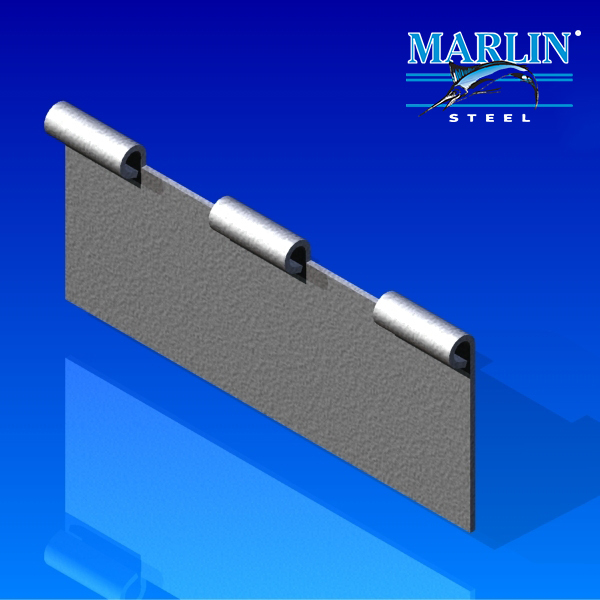 Marlin Steel engineers solve design problems; we can show your part adjacent to other parts so you can confirm the fit, form and function of your part. After print approval, we release travelers to our factory. For example, the Fixture Department makes precise aluminum fixtures, TIG welded together and marked with your part #, to hold your parts. These aluminum fixtures act as a "GO"/"NO GO" tool. Only precisely formed parts fit into the fixture. The Bending Department robots make two or three dimensional parts. The Welding Department mounts the aluminum fixtures on robots that weld the parts consistently (resistance or MIG, depending on the application). For example, our robotic MIG welder welds parts with a tolerance of +/-0.003" in the "x" plane, "y" plane, and "z" plane. The MIG welder is in effect the ultimate quality checker of your parts. Once the parts are welded, we pack them securely, shrink wrap, and ship them raw, or we can provide a finish. Typical finishes include electropolish (for stainless), nickel plating, chrome plating, epoxy coating, powder coating, urethane coating, polyester coating, polyolefin coating, plastisol PVC coating, Teflon coating, nylon coating, and galvanizing.